Koti (means "home" in Finnish), located in Central Manzhou, is a functional and comfortable down-to-earth accommodation choice whose price/value is hard to beat, featuring 3 bedrooms, kitchen and a big living room. Guests rent the whole house fully furnished and equipped, ACs in each room and kitchen with all amenities (fridge, freezer, stove/toaster, stove top, electric kettle, frying pan, kettle, coffee machine, wine glasses, cutlery etc). Note however, that guests need to bring their own toiletries such as shampoo and toothbrush for environmental reasons. We do our best to avoid disposable items and therefore we offer our guests filtered drinking water instead of plastic bottles. Koti has a gorgeous little garden and a terrace with distant mountain view where you can start your day with a private yoga class. You can get fresh ingredients from the near-by farmer´s supermarket and cook your own meals there, or eat delicious dishes in a variety of local restaurants just 350 m down the main road if you don´t feel like cooking. You´ll find a Vietnamese restaurant there too, and a fruit shop that sells probably the best fresh pressed smoothies you´ve ever tasted. Also, 7Eleven has its doors open round the clock. There´s a local breakfast shop just around the corner from Koti with a decent menu. We recommend that you spend some time in Manzhou strolling around, walk those back streets and enjoy the wide open landscape with fields and mountains around you. That is true stress release! Near Koti, there are many natural sites worth visiting within 15-minute ride: Nanren lake, Silinge and Menmalou mountains, Qikong and Shanhai waterfalls, Jialeshui surf beach and many secret spots in the Kenting National Park area that we are glad to share with our well trusted and respected guests. If you increase your time-to-destination range to 30 minutes, you can reach all the main attractions in the peninsula including a number of gorgeous beaches, Kenting shopping street, the historical town of Hengchun, Dajian and Lilong mountains, The National Museum of Marine Biology and Aquarium (world class! ), and all the main diving, snorkeling and surfing spots. Other than those, cycling, birdwatching, hiking, kayaking, bowling, billiards, night markets and hot springs are some of the activities near by, not to forget the numerous historical sites and villages with strong indigenous culture. Apart from yoga classes we offer guided tours, surf lessons and road bike rental with the best-price guarantee, and also pick up/drop off service for smaller groups at the nearest international airport and high speed rail station in Kaohsiung. There´s a good bus network that goes thru Hengchun, too, just 15-20 minutes away from our guesthouses. The bus ride to Kaohsiung takes 2-2,5 hours depending on the traffic. We speak the following languages: English, Chinese, Spanish, French, German, Swedish and Finnish. I am Henri, an outdoor oriented, nature and languages loving Finnish guy who stepped out of the business world a few years ago and moved down south from a big city further up north in Taiwan, in order to have more time for sports (especially surfing), relationship, books and other important things in life that sometimes are left in the shade of office life and career. The better half of me that you see in the picture, is my lovely Taiwanese wife, Cindy. I have travelled around and studied in different countries. I spent a year in Costa Rica as an exchange student at the age of sixteen, did my Erasmus spring term studies in France, Rouen, and graduated in Finland from Turku School of Economics 2005. I came to Taiwan 2012 as an expat of an international sports goods company. Taiwan stole a big piece of my heart immediately. That´s why I´m here to stay, living in this magical Manzhou village now with my wife, two cats and two dogs, right by the Kenting National Park. Koti is located in our home village, Manzhou. Manzhou is a little bit further away from all the main attractions of the area, but not many people realise or even know how much there is to see and do in and around this hidden diamond, Manzhou itself. There are fascinating waterfalls and hikes that Google doesn´t talk about, a variety of local restaurants and some of the most scenic bike routes of Taiwan, not to mention the surf beaches just 10 minutes away. Our Koti guesthouse is located on a quiet street, away from the traffic and crowds. 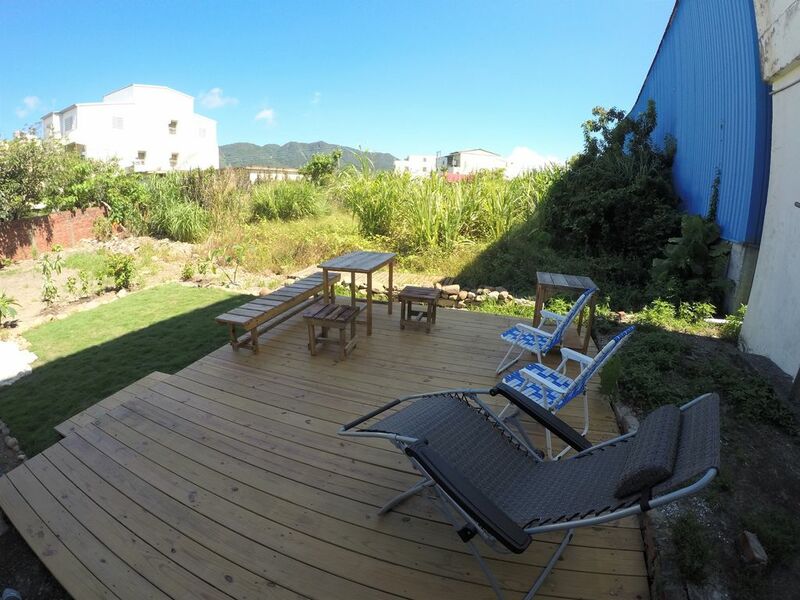 We have a nice little garden and terrace with outdoor furniture and mountain view. You can barbeque there with your friends and family, and take private yoga lessons! There are yoga mats in each room that are well sanitized after guests´ departure.